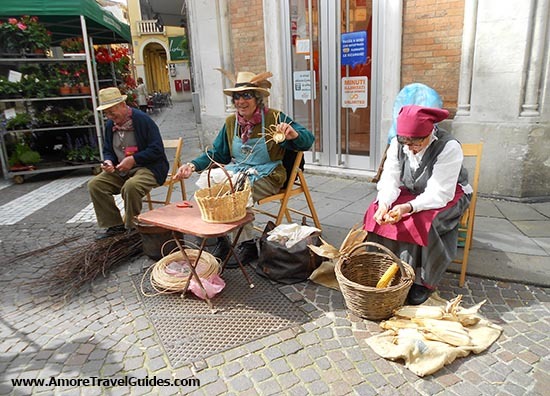 In this video, Rick Steves shares history, facts and his favorite things to do in Padua. I went to Padua in the northeastern part of Italy by mistake.A friend and I were actually planning to go to Verona but it was opera season and the Giro d’Italia was going through Verona when we were going to be there so there were no available hotel rooms. Neither the opera nor the Giro are things Americans tend to think about and if they do they don’t think they would overwhelm a town, but as I learned, they do. When my friend and I sat down to look at a map of where we could stay since Verona was not an option we thought first of Venice and then second that our budget would not allow for 5 nights in Venice which is what we wanted to spend exploring this area of Italy. Since we had both spent a fair amount of time in Venice on previous trips we did not feel the need to break the bank by staying there again. Sitting over coffee, looking at maps, and frantically Googling northeastern Italy on the verge of panic we both said Padua at the same time and scooted on over to TripAdvisor to look for a hotel. Reviews read and reservations made we were able to move on and look forward to our travels. Deciding to stay in Padua was one of the best travel decisions I have ever made. Padua is a wonderful city of about 200,000 that feels much smaller. The arcade streets add to the atmosphere and make carrying an umbrella virtually unnecessary. The city is rich in history, having been founded in 1183 BC it is old even by Italian standards. 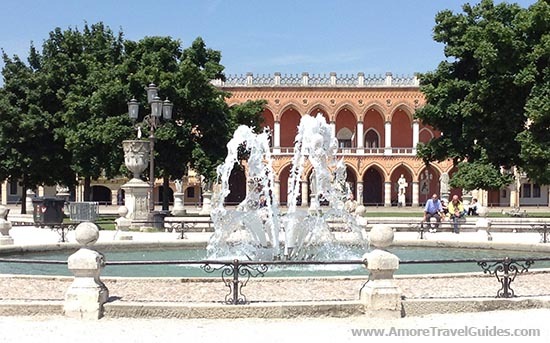 Home to the 800 year old University of Padua the city has the vibrancy that a large student population brings. Bò means ox in the Venetian dialect, I am not sure why that is important but it is in all the guidebooks so I thought I would mention it here. The area is named after an inn that occupied the site before the University was established – the Ox Inn? 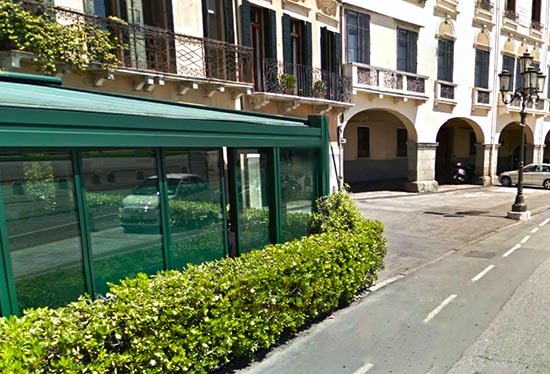 This is the area where the University of Padua is located and is full of stores, markets, and a lot of students. The University has been around since 1222 and is not even the oldest in Italy. That title belongs to the University of Bologna. When I was visiting Padua someone told me that when the University of Padua was established the University of Bologna already had 10,000 students (it was founded in 1088). Dante attended the University of Padua and Galileo taught at the University though several centuries separated them. The University offers a number of different tours. 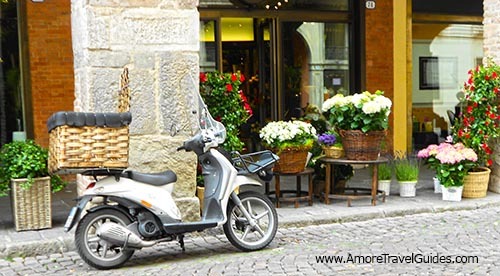 As with many things in Italy you need to check on-line or at the ticket booth to see what tours will be available during your stay since the schedule varies. We went on a tour of the anatomy lab and it was fascinating. The tours are given in two languages depending on the composition of the group. If you are an English speaker check at the ticket booth before you commit to a time to make sure your tour will be in English. I have to say that even if you can’t understand what the guide is saying it is still worth a visit. I searched everywhere for a notebook with the University’s logo on it, the kind of notebook you see college kids in the US carrying everywhere and could never find one. I did finally find a t-shirt in a very touristy little shop, the kind of place I generally don’t go to but I was desperate and happily wear my rapidly fading, made in China t-shirt everywhere. The Capella degli Srovegni is beautiful and definitely worth a visit. The Scrovegni Chapel is famous for its fresco cycle by Giotto considered one of the most important masterpieces of Western Art. The church was completed in 1305 and is surrounded by a Roman amphiteater. Reservations are necessary so you need to plan ahead. Visitors are assigned and entry time and are cycled in and out every 20 minutes. You first enter a small room and watch a video for about 20 minutes before moving into the chapel where you are given a tour that lasts about 20 minutes. We only spent about an hour waiting and touring the chapel, however, we were told that in peak season wait times can be a lot longer and a lot more variable. Our tour was in Italian, if you are with a group you may request a tour in English. I understand some Italian but I am not proficient enough to understand a lecture on art. In some ways not understanding the guide was better. I allowed myself to be immersed in the beauty that surrounded me. You are not allowed to bring anything into the Chapel. All pocketbooks, backpacks, and bags must be checked. There is a museum associated with the Chapel which we did not visit because we had already collected all our bags and would have had to recheck them. Instead we wandered over to the Palazzo Zuckerman. The Palazzo Zuckerman museum is full of art and artifacts from everyday life spanning several centuries. It is one of those museums where you either have to pick and choose what you see or you have to plan to spend several days visiting. I always enjoy seeing things used in everyday life by everyday people, but I can only see so much of it before my eyes start to glaze over. With its towers and domes it is hard to miss St. Anthony’s Basilica. The church is right in the middle of the historic part of the city and so is worth a visit. One of the things I liked best about St. Anthony’s is that photographs are not allowed inside so it is very peaceful without the frenzy of tourists running around taking pictures nonstop. The Prato della Valle is a huge oval surrounded by statues, in fact it is surrounded by a double row of statues. All of the statues are labeled. I looked at a lot of the statues and their labels and don’t think I ever found a name I recognized. You don’t go here for the statues, you go here for one of two reasons. First, you are tired and you need a place to sit. There is a fountain surrounded by benches in the middle of the park where you can sit and stare at the fountain or the people walking around and recharge your batteries. The second reason to visit Prato della Valle is that there is a large market that is part flea market and part fruit and vegetable market. The market clearly draws a mix of locals buying food for the day and tourists buying the typical things you find at a flea market. The Basilica of Santa Giustina is located near the Prato della Valle and is typical of a lot of churches you see in Italy. There is a little store located in this Basilica that on the day we were there was manned by a very enthusiastic, older Italian woman who spoke no English. Most of the products sold in the store were made by monks, or at least that is what I think she said. In any case, I ended up with a tube of very expensive hand lotion that says it was made by monks. Buying it was the least we could do after spending 15 minutes being entertained by her stories of each product in the store. I am sure this was a random event, but we did have to dodge a swarm of yellow jackets on our way in, I almost skipped the church thinking that this was some sort of sign that I should stay away. Everyone and their dog should visit Caffé Pedrocchi. As many times as I have been to Europe and seen dogs at restaurants and bars it never ceases to surprise me. I think my surprise comes from how well behaved the dogs are. I can’t even imagine my 80 pound dog standing calmly at a bar. 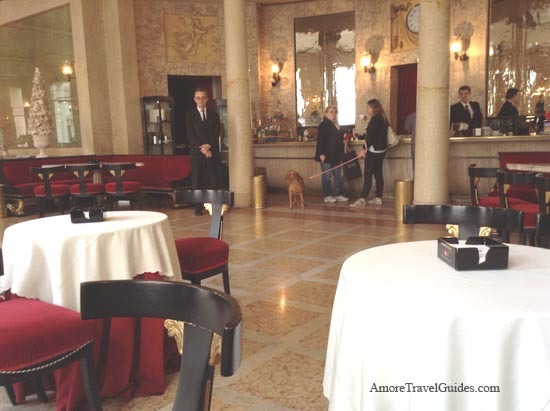 In any case with or without a dog the Caffé Pedrocchi is a wonderful place to while away an hour or so in the afternoon or evening. In fact we went there everyday. Some days we would have a glass of wine, others a Spritz made with Prosecco and Compari or an espresso and even one day a huge bowl of gelato. The drink menu is extensive and reminded me of something you would have seen in the 1950’s with a full selection of drinks made with crème de menthe and brandy. All drinks come with a large platter of appetizers making it the best bargain in the city. The waiters remembered us from one day to the next which was a nice touch. Il Museo del Risorgimento is attached to the Caffé Pedrocchi that tells the history of the Risorgimento. The building that houses the museum is worth seeing and the museum is interesting and different from what you will see in other museums. The museum tells the history of the city. When we were there an elderly docent kept us moving in the right direction. The museum was by no means crowded but you must at all times follow the arrows which were a little confusing since they sent you on a rather circular path. The museum takes about an hour to tour and like I said, the rooms are beautiful and since it is right next to the Caffé Pedrocchi you can reward yourself with a glass of something and a few snacks. The Piazza delle Erbe Market is located directly in front of the Palazzo della Ragione which unfortunately was closed when we went to visit. The Piazza delle Erbe Market is a large outdoor market where you can buy fruits, vegetables, scarves, socks, essentially whatever you need or want. 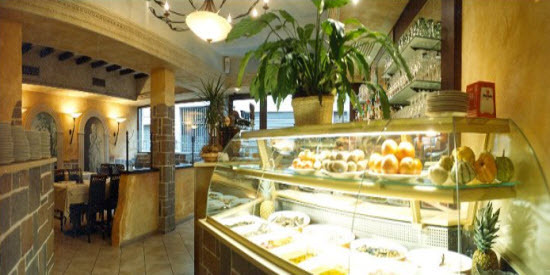 The market is surrounded by restaurants and there is an indoor market with butchers and pastry shops. We had a so-so lunch at one of the small restaurants located in the piazza. The meal was just okay but the people watching was excellent. 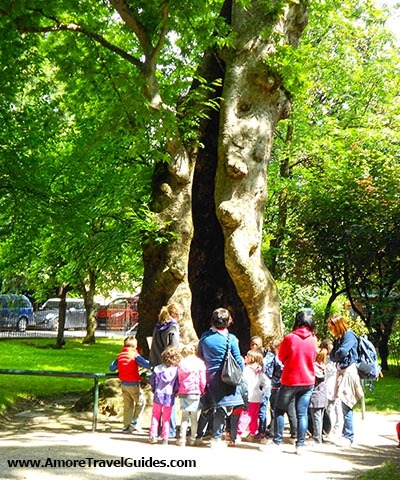 There is a large botanical garden in Padua, Orto Botanico that has been around since 1545. It is the oldest botanical garden that has been located on the same site since its founding, in the world. We were there on a beautiful, cool day when there were a number of elementary school groups on field trips. It was fun watching the kids run around enjoying themselves. There were only a few things in bloom at the time of our visit, but it was still interesting to see the poisonous plants, medicinal plants, everyday herbs, etc. It was a nice break from touring churches, chapels and museums. 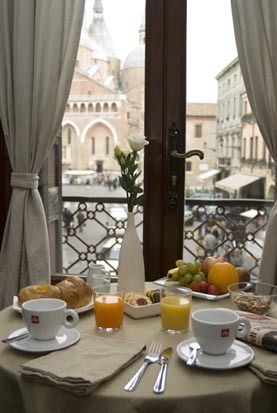 Padua is perfectly located for a day trip to Venice. 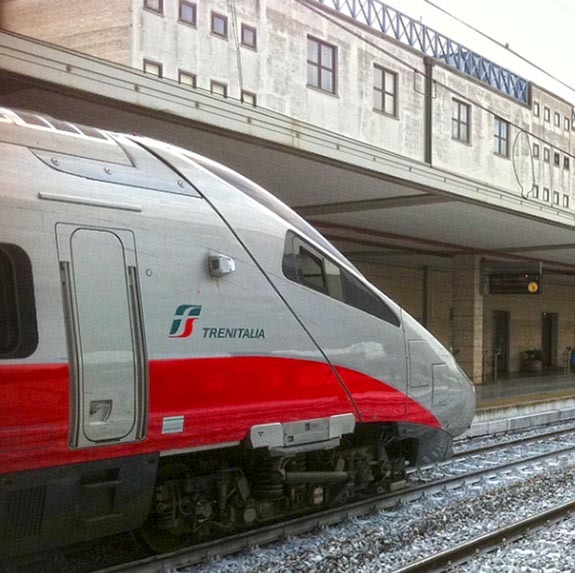 It is only 30 minutes to Venice if you take the fast train. We took a day trip to Verona (another of my favorite cities in this part of Italy). Going there we took the fast train which took about 45 minutes, coming back we took the slow train which took about 1 ½ hours. The fast train got us there but the slow train allowed us to enjoy the scenery. When we got to Verona we took a taxi into the city but we walked back to the train station at the end of our visit. The walk to and from Verona from the train station takes you through some fairly heavy traffic areas, it is not a long walk, but it is a challenging walk. Going to Venice on the other hand, you walk out of the train station and on to a boat. Had we had an extra day we would have made the 20 minute train trip to Vicenza a city that is known for its architecture. I know, I know the best pizza is in Naples but that does not mean there isn’t great pizza elsewhere. We found Pago Pago while we were wandering around looking for Galileo’s house which we never did find. In fact, we found something better – Pago Pago. We got there early which was lucky because the line started forming shortly after we arrived. In fact the line seemed to be one of the best social events in Padua. Locals and tourists alike stood in line to get take-out pizzas chatting in a variety of languages. The restaurant is fairly large with several backrooms but it fills up quickly. We went back for lunch one day and were entertain by a table full of Italian ladies of a certain age who were celebrating something or other with many toasts with many glasses of wine. One of the ladies leaned over to me and made a comment to me that was clearly about one of her table mates. It always surprises me to read reviews of restaurants that I love and find that others have not had the same happy experience that I had. I love Trattoria al Prato. This restaurant overlooks the Prato della Valle. We had dinner there twice and both meals were terrific. We were introduced to wines from the Fruili region at the Trattoria al Prato and spent the rest of our trip trying to find more of these lovely wines. Everything we ate here was delicious. Two middle-aged gentlemen run the restaurant, we could not determine if they were the owners but they were as gracious and lovely and Italian as can be. The service was not fast but why would you want to rush through your dinner? Best of All . . . It’s Cheaper than Venice! By a lot!